Endless heat and tropical nights can give anyone a hard time. This is why more care is needed in summer to avoid exhaustion. Historically, Koreans survived summer by eating nutritious energy foods. Popular summer Korean foods can be roughly categorized as cold foods and hot foods. Yoon Sook-ja, director of the Institute of Traditional Korean Food, recommends delicious Korean cuisines in these categories to help fight summer heat. Samgyetang (photo courtesy of the Institute of Traditional Korean Food). 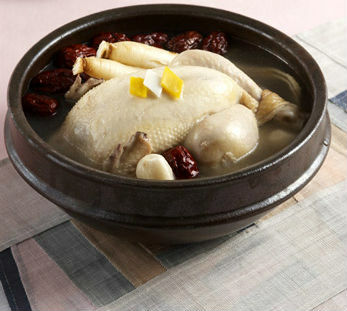 To ward off the heat, samgyetang (chicken soup with ginseng) makes people feel hotter and sweat. They can get more energy by eating this hot food which protects their bodies and prevents exhaustion under the scorching heat. Samgyetang is one of the most popular summer dishes in Korea especially during the three Boknal Days, or the hottest days of summer. Chicken and ginseng, the main ingredients of the dish, warm the inner body. Chicken is rich in proteins and good for digestion. Ginseng helps recovery from fatigue and lowers stress. For this reason, samgyetang makes people have better appetites and strengthens the immune system, preventing them from getting sick. Young chickens are used in this cuisine as it tastes better and has softer texture. Garlic and Oriental medicinal ingredients like milk vetch root are also used in this dish to protect the internal organs and help recover the strength of the body. Glutinous rice put inside the chicken also helps digestion. Click the link below to learn how to cook samgyetang. 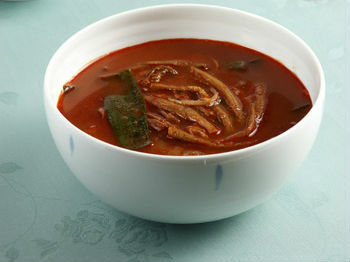 Yukgaejang (photo courtesy of the Institute of Traditional Korean Food). This hot, spicy, and tasty dish is another hot food Yoon recommends for summer. It is made of shredded beef, green onions, chili powder, chili paste, and other ingredients. It is not oily or rich. It is spicy and tasty and best served when hot. In the past, Koreans used to cook a big bowl of soup with a lot of vegetables, herbs, and a small amount of beef in order to serve many people with a relatively low portion of beef when lacking food. This traditional way of cooking became the recipe of today’s yukgaejang. 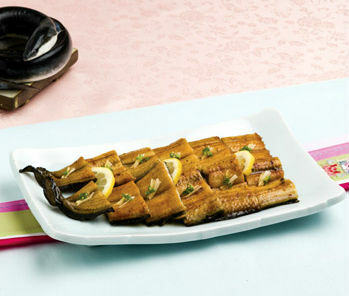 Roasted eel (photo courtesy of the Institute of Traditional Korean Food). Eel, or jang-eo in Korean, is one of the most popular stamina foods especially good for summer as it is high in proteins, fat, and unsaturated fats. Eel prevents adult lifestyle diseases. Its high proportion of lecithin improves memory and learning capability. Eels are high in vitamin A, 200 times higher than beef, and are high in vitamin B1 and B2. Its unsaturated fats help strengthen capillaries. Eel is best eaten with ginger as it removes the fishy smell and helps digestion and absorption of proteins and fat. Its antibiotic and sterilizing effects also prevent food poisoning. 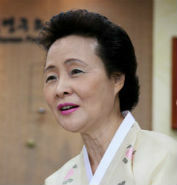 Imjasutang (photo courtesy of the Institute of Traditional Korean Food). Imjasutang also uses chicken as its main ingredient but it is best eaten when cold. This cuisine used to be favored inside the court or yangban aristocratic class of the Joseon Dynasty (1392-1910). Some people call this as “kkaetguktang,” as “imja” means sesame or “kkae” in Korean. Sesame and chicken are its main ingredients. It is made of shredded chicken and roasted and powdered sesame and consumed with vegetables like cucumber, water parsley, and mushrooms. According to Oriental medicine, sesame makes the body feel lighter and clears the brain, and protects the so-called five inner organs — heart, liver, lungs, kidney, and spleen. Thanks to its savory taste and aromatic smell, sesame is used as a spice and known to be good for patients, children, and seniors. It also lowers stress. As both chicken and sesame are nutritious and increase the appetite, the two ingredients create a harmony of both taste and nutrition. 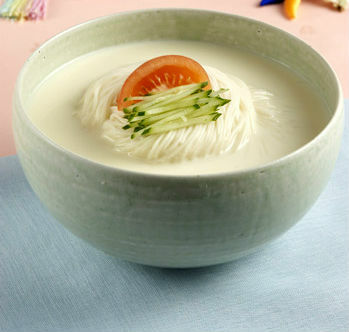 Kongguksu (photo courtesy of the Institute of Traditional Korean Food). Kongguksu or soybean noodle consists of noodles made of flour in a soymilk-based broth. Its cool and clean nutty taste is widely enjoyed in summer along with naengmyeon or cold noodle. This is especially good for vegetarians, as soybeans are regarded as “meat from the land” due to being high in proteins and essential amino acids. Flour is known to be a good ingredient for summer as it reduces fever, quenches thirst, and can be eaten as a substitute for rice. The dish can become perfect for nutrition by adding slices of cucumber or tomato. 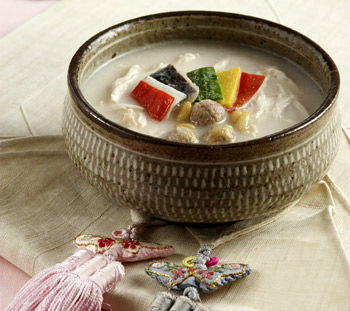 Kongguksu varieties can be found around the provinces. Some people add sesame, peanuts, or walnuts to add more flavors to the soymilk broth. Black beans or black sesame are also used to create more flavors and for decoration. Naengmyeon (photo courtesy of the Institute of Traditional Korean Food). Naengmyeon is a bowl of cold noodles served in chilled broth. This is one of the most popular summer dishes in Korea. 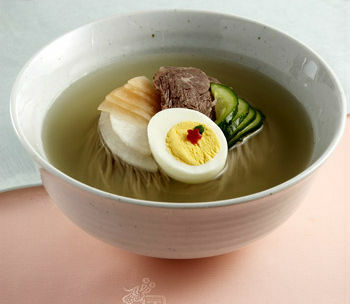 Naengmyeon was especially loved by King Gojong (1852-1919) of the Joseon Dynasty. According to records, the king preferred having naengmyeon as a favorite night snack as he preferred something less salty and spicy. The king’s favorite cold noodles were served with pieces of beef, pine nuts, and slices of pear in dongchimi, a variety of kimchi composed of Chinese cabbage, chili, ginger, pear, and clean watery brine. His love for naengmyeon continued when he stayed in Deoksugung Palace after he abdicated the throne to his son — King Sunjong (1874-1926). Old records on naengmyeon can be found in Gyuhapchongseo (閨閤叢書, 1815), or Dongguksesigi (東國歲時記, 1849). According to a record in Gyuhapchongseo, “naengmyeon is a cold noodle served in dongchimi with slices of radish, cucumber, pear, citron, pork, and egg.” Dongguksesigi contains a record of naengmyeon made of buckwheat noodle which is served with various kimchi varieties and slices of pork. 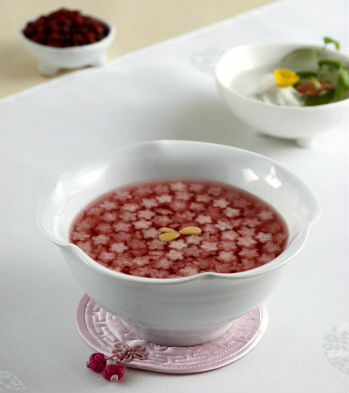 Omija hwachae (photo courtesy of the Institute of Traditional Korean Food). After having summer food, try omija hwachae or omija fruit punch. This is one of the popular traditional Korean drinks for summer. It is made of the fruit herb omija, meaning “five-flavor fruit” as the herb has five tastes — sweet, bitter, sour, hot, and spicy. When dried and soaked, the herb generates a pink juice. Omija is widely used in Korean foods ranging from traditional drinks to sweets. It quenches thirst, increases energy, loosens phlegm, and stops diarrhea and perspiration. To make omija hwachae, the sieved water of dried and soaked omija fruit is used. Sugar and honey are added to the sieved water with slices of pear or other fruits and pieces of pine nuts. What is the Dongui Bogam?